Latvia 5 euro 2014 "Old Stenders"
Obverse: A theme from the title page of the first edition of the "Book of High Wisdom on the World and Nature" (1774) by Gotthard Friedrich Stender (1714–1796) is a central motif: a pastor is showing a boy how full of wonders this world is. At the top on the left, there are semi-circled inscriptions 2014 and LATVIJA. Reverse: The reverse of the coin features the progressive idea of the world, the heliocentric concept of the universe. The image comprises the inscriptions "G. F. Stender" and "Latwis". Above it, there are semi-circled inscriptions VECAIS STENDERS on the left and "5 euro" slightly on the right. 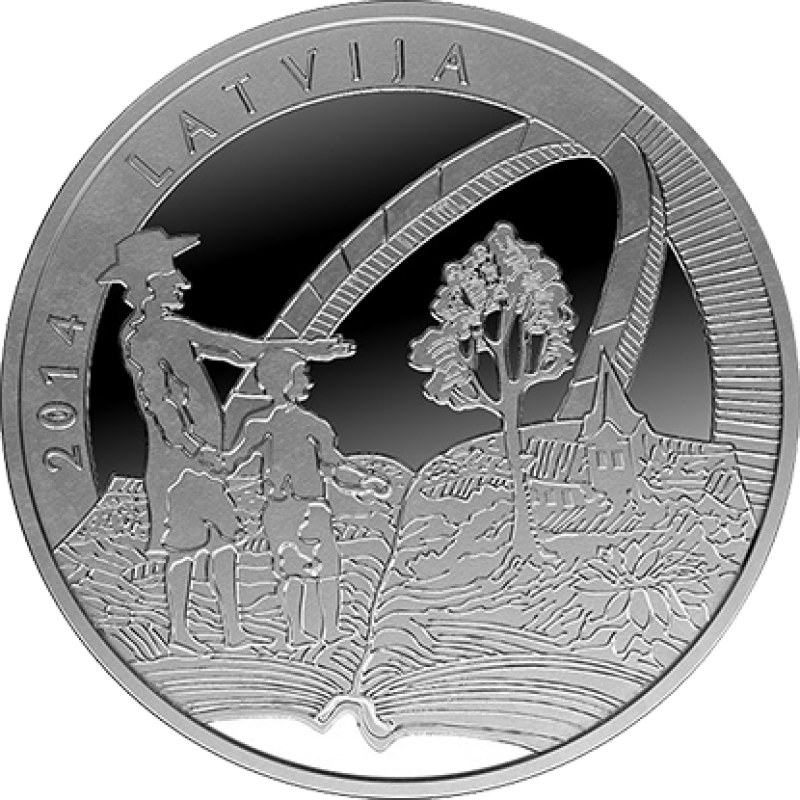 Edge: The inscriptions LATVIJAS REPUBLIKA and LATVIJAS BANKA, separated by rhombic dots. The UNESCO events calendar for 2014 includes, among others, the 300th anniversary of the Latvian writer, linguist and thinker Gotthard Friedrich Stender (1714–1796), thus celebrating his fundamental contribution in the area of culture, education and science, including inter-cultural dialogue. G. F. Stender (nicknamed Vecais Stenders, Old Stenders) is an outstanding representative of the 18th century Enlightenment. He was a German born in the pastoral estate of Laši (now Eglaine), Duchy of Courland and Semigallia. He studied philosophy and theology at Universities of Jena and Halle and served both as a pastor and as an inventor (he made globes for the royal court of Denmark; provided a method for determining the geographical longitude at sea, and even constructed a primitive washing machine). In 1765, he returned to his native land and spent the last thirty years of his life to enlighten and educate the Latvian serfs. Old Stenders is considered the founder of Latvian secular literature: he wrote fairy-tales, fables, short stories and popular songs; he compiled ABCs in Latvian and performed tasks essential for the formation of a cultural nation: writing a grammar of the Latvian language and putting together a Latvian–German and German–Latvian dictionary. Old Stenders' most outstanding work is his "Book of High Wisdom on the World and Nature" (1774), in fact, the first peasant encyclopaedia in Europe. There, Old Stenders explains natural phenomena and the basic principles of physics and astronomy, including rotating of the Earth around its axis and around the Sun, and gives basic insights into issues related to meteorology, zoology, botany, chemistry and geography as well as tells his readers about mountains and deserts, earthquakes and volcanoes, seas and rivers. Old Stenders may not have had the range of other figures of the Enlightenment like Jean-Jacques Rousseau, Voltaire, Denis Diderot, or Johann Gottfried Herder, yet his contribution to the evolution of Latvian nation is invaluable. He taught Latvians to think and was the first to offer praise to his native land in poetry. Confirming his unity with the emerging Latvian nation, he had his headstone in Sunākste (now Viesīte region) supplemented with the word "Latwis" – Latvian. The obverse of the coin dedicated to Old Stenders has borrowed the theme from the title page of the first edition of the "Book of High Wisdom on the World and Nature": a pastor is showing a boy how full of wonders this world is. 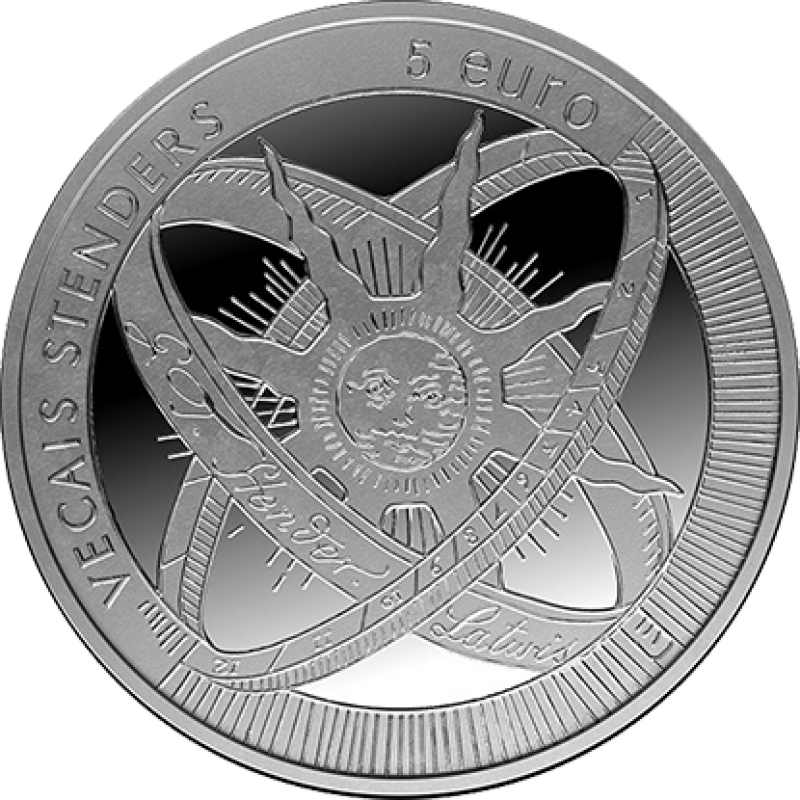 The reverse of the coin features the progressive idea of the world, the heliocentric concept of the universe.